You are currently browsing the tag archive for the ‘Get Set’ tag. A Post From The Olympic Museum, Lausanne, Switzerland. 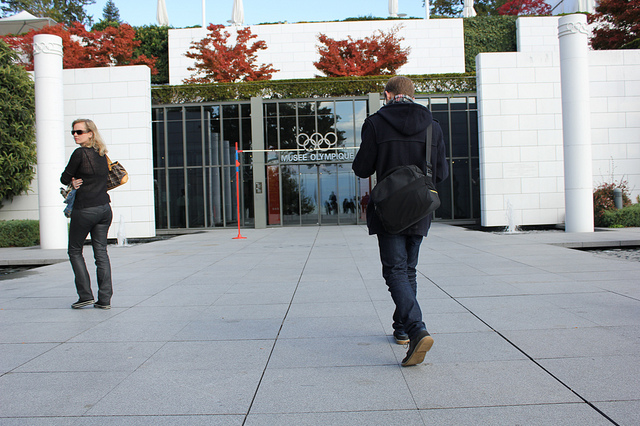 Last Thursday, 20/10/2011, Fran, Charlie, Bianca, Claudia, Kaspian and I were lucky enough to visit the Olympic Museum in Lausanne, a beautiful town on the edge of Lake Geneva in Switzerland. This post was written towards the end of a wonderful day. Today has been something of a whirlwind; up at 3:30 am, on the plane for 6:45 am and on a private tour of the museum by 10:30. The Olympic Museum has been open for eighteen years now, which almost seems like quite a short amount of time considering the hundreds of years of history that is encapsulated within the spiraling four walls of the building which also hosts the International Olympic Committee whenever they convene. So, what can be taken away from today? Clearly two views which don’t tally up with each other in 2011 but the fact that the Olympic Museum , run by the IOC is perfectly happy to expose its own failings was a real breath of fresh air. In the same room as Usain Bolt’s 100m final jersey is an entire wall dedicated to the issue of doping and the games. To me this seems to be a clear message from the IOC to the countries it gives the games to; everybody makes mistakes, including the IOC and host countries, what’s important is that we face up to these mistakes whilst celebrating our triumphs. Sentiments that some would do well to take note of.